a bag of pillow fluff. Making sense of mathematical concepts is no laughing matter in the elementary grades, but a bit of jolly rhyme and some zany, rainbow-colored cats on your side couldn't hurt. To that end, Brian P. Cleary and Brian Gable are back with their latest entry in their very popular concept series, Math Is Categorical/Words Are Categorical (Millbrook Press). It weighs about an ounce. are measured by the ton. and it's not your parents' mothers. it's smaller than most others. weigh near 1 gram, you know. you've learned a TON of stuff. 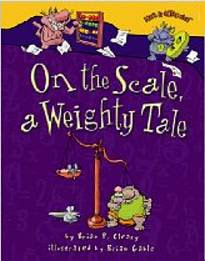 At a bargain price, this title and others in these two notable co-series do an admirable job in explaining grammatical terms and mathematical operations to the elementary reader. Take a look, for example, at their tantalizingly titled How Much Can a Bare Bear Bear? : What Are Homonyms and Homophones? (Words Are Categorical), Hairy, Scary, Ordinary: What Is an Adjective? (Words Are Categorical), Pitch and Throw, Grasp and Know: What Is a Synonym? (Words Are Categorical) , and, that wordsmith's favorite, Rhyme & Punishment: Adventures in Wordplay. And for the numerically numb, see, for example, The Action of Subtraction (Math Is Categorical) and The Mission of Addition (Math Is Categorical). Great for teachers, homeschoolers, and just plain interested parents, and fun enough for kids to pick them up on their own, this title and its series mates make a good jumping off place for some heavy-duty concepts.